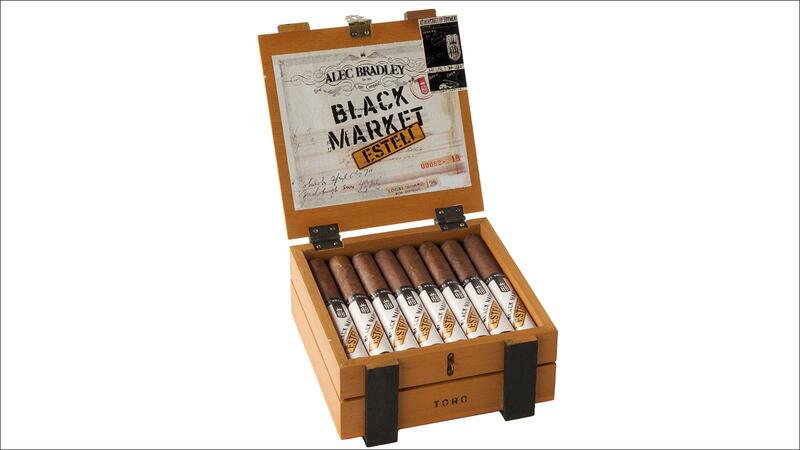 Alec Bradley Black Market Estelí ships in 22-count boxes. If you've seen some interesting variations of Prensado and Black Market at your local brick and mortar, it's because the company quietly staggered Alec Bradley Prensado Lost Art and Alec Bradley Black Market Estelí into the market last year. While the cigars are already available at select retailers, the two brands will launch globally next month, with a formal debut at the International Premium Cigar & Pipe Retailers trade show in Las Vegas. "Lost Art and Estelí have been previously marketed in limited quantities and are now ready for their global release," Alan Rubin, owner of Alec Bradley Cigar Co. said. Alec Bradley Black Market Estelí (top) and Alec Bradley Prensado Lost Art (bottom). The company describes the offshoot brands as complements to the original Prensado and Black Market lines. (The Prensado Churchill size was named Cigar Aficionado's Cigar of the Year in 2011.) From a tobacco blend perspective, however, the new cigars bear little resemblance to their predecessors. Prensado Lost Art is draped in a Honduran Corojo wrapper with two binders—one from Nicaragua and the other from Honduras. The fillers are also from Nicaragua and Honduras. The cigar is available in five sizes: Robusto, at 5 inches by 52 ring; Gran Toro, at 6 1/4 by 52; Churchill, at 7 by 50; Torpedo at 6 1/2 by 52; and Double T, at 6 by 60. The cigars ship in 20-count boxes. Black Market Estelí is rolled with a Nicaraguan wrapper and two binders from Nicaragua and Honduras. The filler is from Nicaragua. Black Market Estelí will come in five sizes: Robusto, at 5 inches by 52 ring; Toro, at 6 by 52; Churchill, at 7 by 50; Torpedo at 6 1/2 by 52; and Gordo, at 6 by 60. The cigars ship in 22-count boxes. Factory information and pricing for both brands will be disclosed at the IPCPR trade show, which begins July 11, 2017.